Brewery: Drake’s Brewing Company website. How served: 22oz capped bomber poured into an Ommegang glass. I paired this beer with: Grilled Tilapia topped with a spicy salsa. Note: This beer poured a copper color with a 2 finger light tan head. It left a thin lace near the bottom of the glass. The nose was both malty sweet & had piney and grapefruit notes. The taste was leaning more towards a Barleywine then a DIPA, it was malty sweet up front, then bitter on the back side and very well balanced. It could be that the hops have faded since this beer is about 5 months old. The mouthfeel was smooth with a medium body. The drinkability was very good and leaves you wanting a 2nd Bottle. On the Label: Silver Medal Winner, Imperial India Pale Ale, 2009 Great American Beer Festival. A Double IPA, Denogginizer is a big bold beer hopped with an abundant amout of Simcoe & Columbus, with a touch of Amarillo & Cascade. Mashed with Munich & Crystal Malt for color and flavor…and to balance out the hop assault. Drake’s ales are urban-brewed at the former Caterpillar powerhouse in industrial San Leandro, California. Our brewery is more gritty than pretty, but with great hops & barley malt, our talented brewers have been turning out unique and delicious beers here for over 20 years. 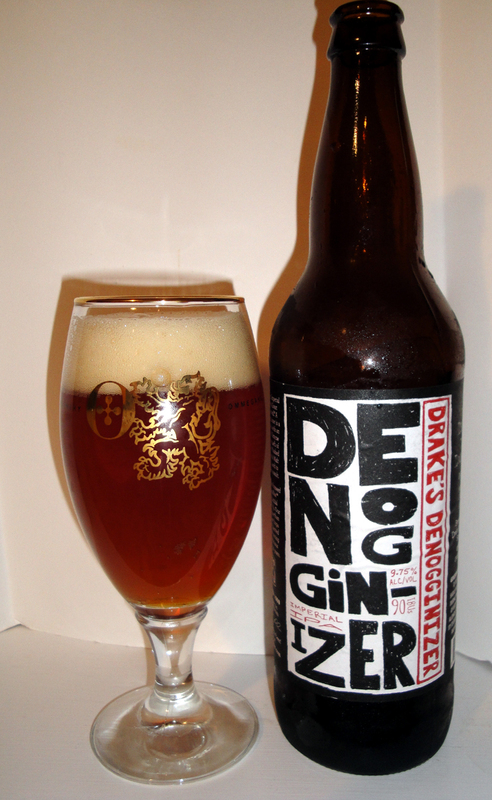 From their website: Drake’s Denogginizer Double India Pale Ale – 10% ABV, 100 IBUs!